With the recent entry of OTIS Eyewear into the US market and the recent plans to reposition Creatures of Leisure in the surf accessories space, this will be a great opportunity for Dace Steumpfig to help shape the future of both brands. 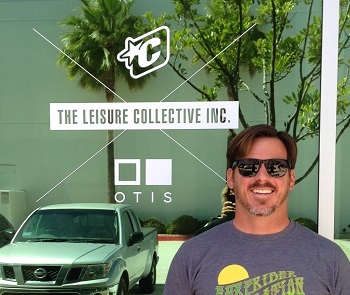 Oceanside, CA – The Leisure Collective Inc., parent company of Australian founded brands OTIS Eyewear and Creatures of Leisure, is proud to welcome Dave Stuempfig to the Leisure Collective team. Dave will be taking on Product Development and Strategy for the Leisure Collective brands as Global Head of Product. Dave joins the Oceanside-based office with valuable experience, Sean Kelly, Director of Operations at Leisure Collective says, "We are excited to welcome Dave Stuempfig to our team. Dave coming on board is a big win for our business. Dave's experience in product development, sourcing and go-to-market strategies will be a tremendous asset for our brands." Dave's previous roles included working with brands such as On a Mission, DC Shoes, Aaron Chang and most recently as men's footwear Senior Developer at Reef. With the recent entry of OTIS Eyewear into the US market and the recent plans to reposition Creatures of Leisure in the surf accessories space, this will be a great opportunity for Steumpfig to help shape the future of both brands. Dave is equally grateful for the opportunity;"I am thrilled to join the talented team at Creatures of Leisure and Otis. I have been using Creatures of Leisure's accessories for the last 20 years and to now have a chance to work on the products of the future is an amazing opportunity. Otis comes into the market offering great styles and a unique premium point of view with the mineral glass lenses. I look forward to being a part of the bright future of both of these great brands." The Leisure Collective International ("TLCI") is the owner and manufacturer of globally recognized brands 'Creatures of Leisure' and 'Otis Eyewear', specializing in premium surfing hardware accessories & high quality eyewear. The brands have been established for over 25 years and 13 years respectively and are distributed to international markets across 30 countries. TLCI operates globally with wholly owned distribution businesses in Australia, USA and Europe.